By Dennis Lin, Eleanor Huang, Johnny Fang and Ryan Teng, Moxa. Creating a network management interface of devices and systems using different protocols can create risks and management issues that can compromise effectiveness and security for substation automation networks. An efficient and visually represented PRP/HSR network using Power Scada with specially designed management middleware can effectively avoid these problems. 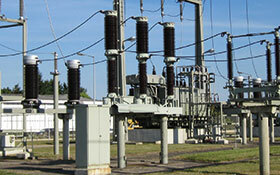 Traditional substation automation system (SAS) structure is an end-to-end hard-wired network. This makes sure all communication is in real-time and that responses are quick. However, when the network communication system has been upgraded to an Ethernet-based network, all the devices are connected to Ethernet devices, such as switches and routers. This results in a potential risk of network communication latency due to network topology changes, traffic congestion, or packet queue prioritisation. For mission-critical or time-sensitive applications, even millisecond long network interruptions cannot be tolerated, as they may severely impact system operation or jeopardise onsite personnel safety. The IEC 62439 standard states that the time that the plant allows for recovery before taking emergency actions (e.g., emergency shut-down, fall-back mode) should be less than 10 ms. In IEC 61850 edition 2, it also clearly states that the communication redundancy times of GOOSE and SMV protocols in substation automation systems are required to be bumpless. The Parallel Redundancy Protocol (PRP) and High-availability Seamless Redundancy (HSR) protocols described in IEC 62439-3 are two technologies that provide seamless failover from a single point of failure. PRP achieves active network redundancy by packet duplication over two independent networks that operate in parallel, whereas HSR is designed primarily for ring topologies. Based on these two seamless redundancy protocols, a redundancy box (Redbox) can quickly activate non-HSR or non-PRP end devices connected to HSR or PRP networks with zero switch-over time. Mission-critical applications in SAS communication can benefit from these redundancy technologies to ensure network reliability. Redundant network monitoring and troubleshooting Networks commonly use MAC and IP addresses as management units to control the network and various network devices. However, PRP/HSR is a very new technology that duplicates packets on the link layer by using the same MAC address, ensuring that the client end can receive packets even in the event of a communication problem. Unfortunately, the current network management system is unable to detect that the packet has been duplicated, so the user cannot see whether both packets have been received or not. Detecting whether or not both packets have been received gives im­portant information about the quality of the link and the health of the redundant network. Hence, managing and monitoring the PRP/HSR network is more difficult because system administrators will not know the redundant network’s real-time status. Troubleshooting for the failed redundant path also becomes another big challenge since the failure point of the network is unknown. Manufacturing Messaging Specification (MMS) is the main monitoring and messaging protocol used for communication in IEC 61850 compliant systems. However, as more and more networking devices have been increasingly implemented in the IEC 61850 system, devices that do not run MMS, such as industrial Ethernet switches and embedded computers, have also become important for communication and control. In contrast to IEC 61850 devices, the protocol used today for managing IT equipment is Simple Network Management Protocol (SNMP), a protocol entirely distinct from MMS, based on a wholly different logical structure. As PRP/HSR devices use Supervision Frame for device management, it is difficult to integrate these two systems for monitoring and management. The fact of there being different device and network management protocols, MMS for IEC 61850 control devices and SNMP for IT or networking devices, results in an incapacity of the central management suite, such as Power Scada, to manage both control devices and networking devices in a centralised manner. Given the fact that most market-available Power Scada software suites are compatible only to MMS protocol but not SNMP or Supervision Frame, network management on a single Power Scada becomes impossible; the networking devices are invisible on the Power Scada. As a result, IEC 61850 system operators may not be able to correct or prevent system failures using the information provided by Power Scada. Some users have been using a PRP/HSR Redbox to enable a conventional computer to join the PRP/HSR network. However, this could add the risk of a single link/node failure. Instead, using a native PRP/HSR computer can avoid the risk of a single link/node failure. 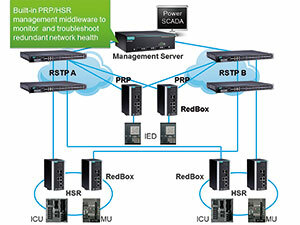 The best use of native PRP/HSR substation computers is to deploy a PRP/HSR-capable Power Scada management server. With some specially designed PRP/HSR management middleware built in, the PPR/HSR management server can enable the Power Scada to collect and analyse the raw data from various distributed devices. The current redundant network status can be fully monitored, and the single-point failure can be immediately discovered. This makes real-time troubleshooting a simple task. Even system administrators with little knowledge of PRP/HSR technology can easily manage, monitor, and troubleshoot the PRP/HSR network on a single Power Scada platform. The PRP/HSR management middleware should be able to support both SNMP and MMS interfaces, allowing the connection of various substation devices that run different communication protocols. The integration of the middleware and Power Scada enable all data to be effortlessly used and read in the substation Power Scada system through MMS protocol. Substation operators find it easy to manage all devices on the PRP/HSR system via the Power Scada visual tools. In addition, troubleshooting can be easy as any single failure point can be shown on the Power Scada, making the SAS or any other PRP/HSR applications more reliable and stable. Even though there is a unified standard for PRP/HSR protocol, there is no standard for the network management interface. Using a native PRP/HSR management server with a built-in management middleware can help collect, analyse, and integrate all raw data from various devices on one single management platform. This makes network diag­nosis, troubleshooting, and device condition ­monitoring easier than ever. In today’s industrial processing environment, industrial Ethernet has become a de-facto standard to connect to the company’s PLCs in manufacturing, IEDs in substations and cameras for CCTV, in harsh environments. All of these demand ruggedised networking switches to ensure stable communications to the company’s scada, ERP and MES software. Often, industrial networking products are installed in and around the production areas where they are subjected to high temperatures, vibrations and electrical noise from VSDs and motors.